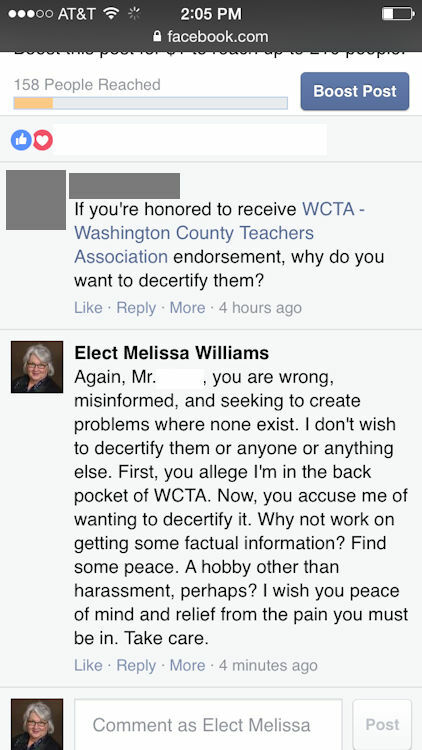 A question on my campaign Facebook page recently asked why I want to decertify the Washington County Teachers Association. This is a prime example of the falsehoods being stated by this individual, his multiple personalities, and by others. An earlier rumor states that I am in the back pocket of the teachers union. Wow. I'm a union rubber stamp who also wants to decertify the union. You can't make this stuff up! This particular campaign dirty trick tactic is to state a lie as often as possible until people begin to believe it. I don't think the voters will be quite so easy to fool. Should you ever have a question about a rumor or what you've read in the paper, please contact me. I'll be glad to separate fiction from truth. Below is a screen shot of my answer. I've obscured the poster's identifying info.